Do you find it difficult to stay on top of annual reminders? Is your diary system already out of date? How easy is it for you to remind customers their annual service is due? Look no further – Gas Checker creates annual service reminders 11 months after a Gas Certificate is issued. Gas Checker’s legendary system takes away all hassle with it’s automated reminder system. Simply make sure your certificates are synced to your Gas Checker Dashboard, then relax and watch last year’s jobs come back to you. Sync your files by going into The Gas Checker app on your device and press sync in settings. The very day a file becomes 11 months old you’ll get an email in the morning and depending on how your sending preferences are set your customer will automatically get a reminder too. Renew the file using the Gas Checker renew feature next year and the whole thing starts over again. 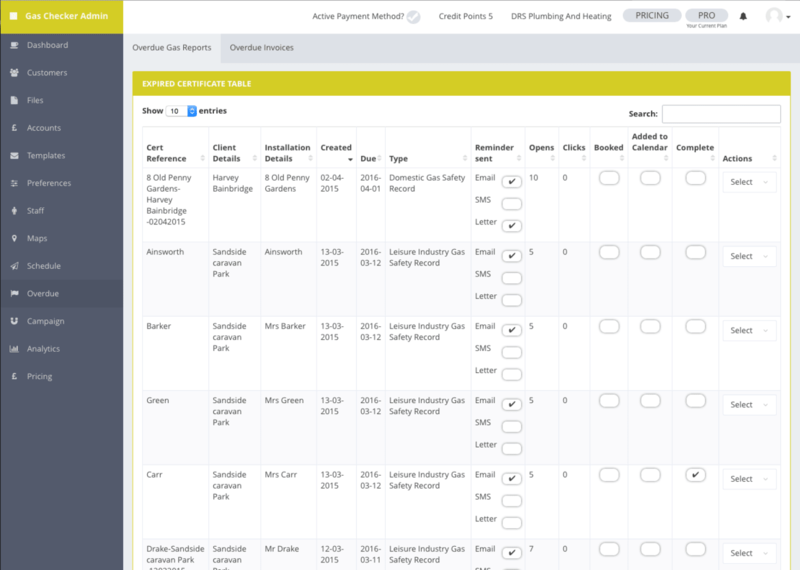 All your reminders are sent to you by email and are automatically inserted to your online overdue gas reports table (pictured above), making it easy to see which jobs are outstanding, which are completed and the status of each reminder. To customise your reminders or set your sending preferences log into the dashboard.